Once a year, I experiment with changing up my regular meat consuming diet and switch out and be a pure herbivore for a week. I’ve always found it challenging as it’s difficult to do in a third world country like the Philippines as there aren’t that many vegan only meals here. There’s usually some kind of meat or dairy products in a lot of things that are served here for one reason or another. This is why I usually resort to cooking my own meals during this time period. I will say that my week as a vegan was hit and miss this year. Earlier this year, I decided to start working out again to gain more muscle and weigh more. Well, I started the week at around 127 pounds and I ended up weighing in at 122 pounds afterwards. Not a great outcome but the good news is that, if you’re looking to lose a few extra pounds, I can definitely say that veganism is a great way to do that. I did seem to lose a lot of my “skinny fat” around my waist so it’s not all bad news. Anyway, I can say I enjoyed myself because, even though I didn’t eat any kind of animal products for an entire week, I never felt unsatisfied or hungry like previous attempts. Maybe it’s because I tried out a few different recipes that made me feel I was eating meat and they all tasted really good. I decided to outline the things I ate during my week. These aren’t detailed instructions on how to make them as I never really measured anything out while I prepared these dishes. I’m just sharing them as I thought that, if you do want to try avoiding meat for a while to lose weight (which is what happened to me, whether I liked it or not), you may try what’s outlined here. Ever since I tried to bulk up, I’ve had the same breakfast over and over again: steel cut oatmeal and two scrambled eggs mixed with chili flakes. I still was able to eat the oatmeal but I obviously had to cut out the eggs. I substituted the scrambled eggs with a pea protein shake mixed with soy milk. The soy milk is something you can easily get at your local supermarket. The pea protein powder I had to get at Healthy Options. 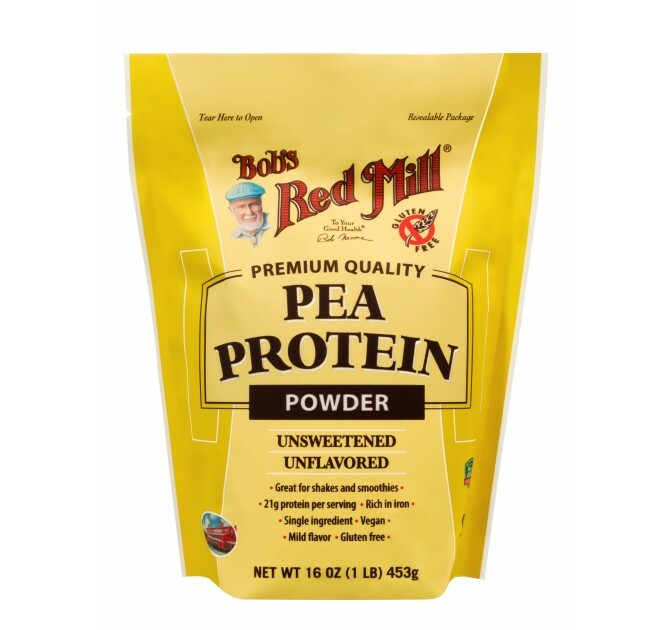 Any vegan protein powder would’ve been okay to me but I got the Bob’s Red Mill Pea Protein Powder since it was the cheapest. I didn’t know there was so much protein in peas. The package does say “unflavored” but that doesn’t mean it doesn’t have any flavor. Unfortunately, pea protein powder taste like, well, pea powder. Just imagine putting peas in a blender until it’s a liquid then you get the idea of what it tastes like. I may like peas but I don’t like it in liquid form. I will say it was rather disgusting for the first few days of drinking it but I got used to the “flavor” eventually. Adobo is possibly the most popular local dish in the Philippines. That’s because it’s simple to prepare as, at its heart, it’s just anything kind of meat or vegetable that’s been swimming in a mixture of vinegar, garlic and soy sauce. I tried making a vegan version using tofu and eggplant. I will say this was something I heavily disliked initially as I cooked the tofu and eggplant like they were meat, which meant I marinated the ingredients in the vinegar and soy sauce mixture without frying them. This made both of those ingredients just absorbing the strong sourness of the vinegar and the sourness only intensified after I finished bringing everything to a boil. This was moreso for the eggplant than the tofu. Oh, and the entire thing didn’t look appetizing at all, which is why I didn’t bother taking a picture of it. It looked really yucky. However, there is another saying about adobo and that it tastes better after a day. This was true for my tofu and eggplant adobo. While it still looked pretty disgusting, the sourness had mellowed out a lot, making it more palatable to me. If I make this dish in the future, maybe I should fry everything first before adding them to the vinegar and soy sauce mixture… or just wait a day before actually serving it. 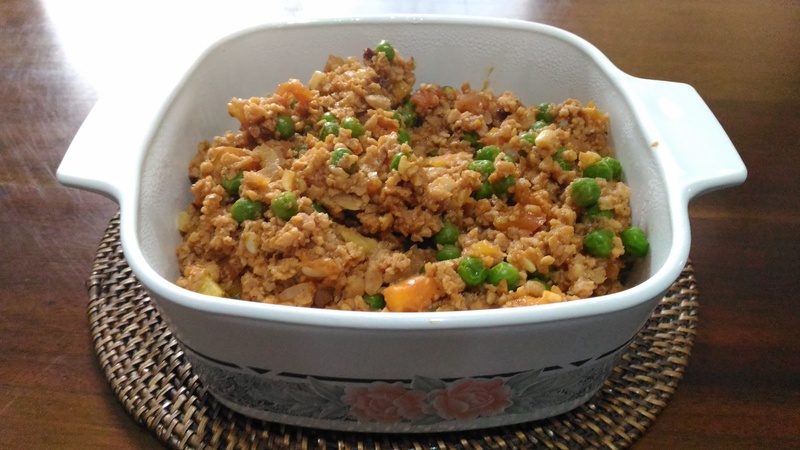 One of my new “weapons” for being a vegan this year was Textured Vegetable Protein or TVP. I actually reviewed Bob’s Red Mill’s version of the stuff last week but, in short, when prepared, TVP takes on the consistency of cooked ground meat. This was the biggest reason why I never felt unsatiated from not eating any beef, chicken or pork. 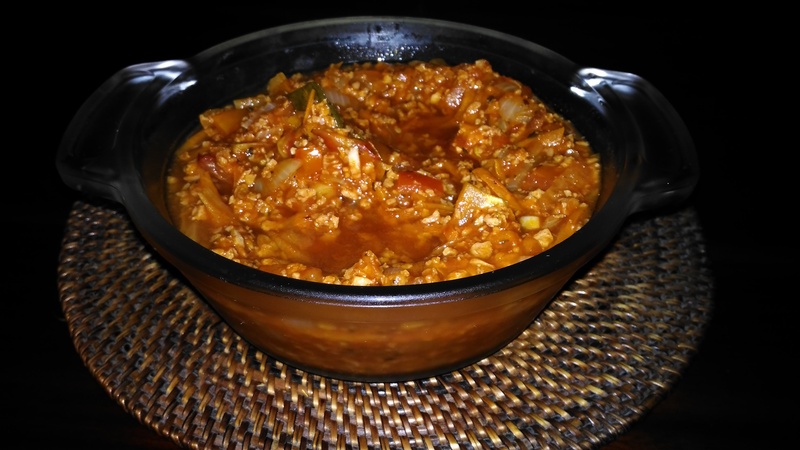 I made a couple of dishes using Textured Vegetable Protein and one of them was a Vegan Bolognese sauce. Looks… fine. Hey, I’m not a professional chef, okay? I generally followed the recipe for your typical bolognese sauce. This included chopping a white onion very finely into slivers, mincing a head of garlic, dicing a bunch of tomatoes and grating a carrot. Obviously, I substituted the ground beef with the TVP but I used vegetable stock in it. Also, regular bolognese calls for red wine but, since I don’t drink wine or any kind of alcohol as I’m allergic, I replaced it with vegetable stock. I know you’re supposed to “cook off” the red wine but I didn’t want to take the risk. Spices I added were oregano, marjoram, paprika, bay leaves and cayenne pepper. Of course, a little salt and pepper. This was a hassle to make because of all the fine chopping and grating needed to prepare this vegetable bolognese but it was worth it. This really came out tasting great and the grated carrot and the TVP gave the sauce a lot of substance and body. It was filling in spaghetti because of it and I totally didn’t mind having to eat this for several days. Vegi Soup Mix is actually a staple of when I go vegan as it’s so simple to cook up. All you need is some Bob’s Red Mill Vegi Soup Mix, vegetable broth and a slow cooker/crock pot and you have a hearty meal. This serves a whole lot. Basically, you just throw in a cup of the Vegi Soup Mix and around three to four cups of vegetable broth (I used a vegetable bouillon cube instead) into your crock pot and cook on high for around two hours and Bob’s your uncle. Add salt as necessary. I do have to warn you that the soup can get really thick depending on the vegetable stock you use and how much liquid you use. 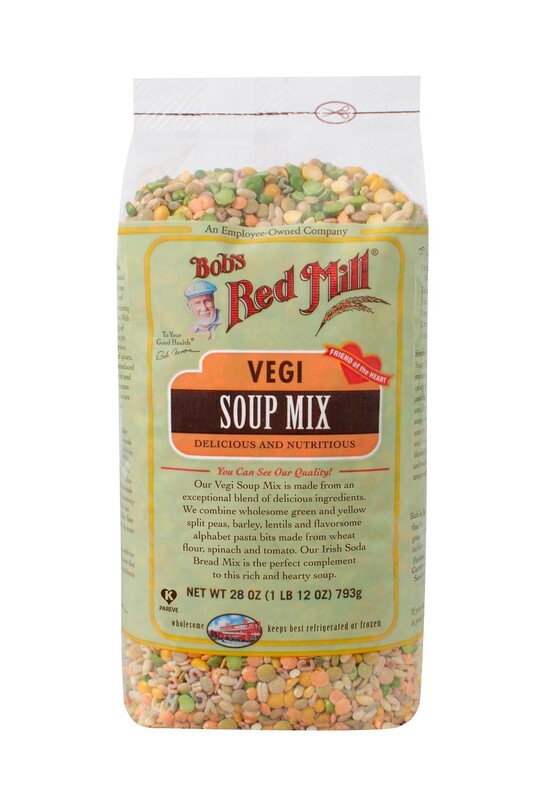 If you want a light soup, you may want to reduce the amount of Vegi Soup Mix. Yep, nothing really amazing here. Just your regular old peanut butter sandwiches, which was good because I love peanut butter sandwiches! Of course peanut butter is vegan but I did have to be extra cautious about the bread as they usually include some kind of dairy product like eggs, milk or even whey powder. Still, peanut butter sandwiches are a great way to snack while I was vegan for that week. My vegan chili was a really good dish as it was so versatile. It could work as a main dish with rice. It could be eaten with bread. You can even mix it with a pasta! It was good and relatively simple to make. I made my version of vegan chili by frying one minced head of garlic, one chopped large white onion, around a cup of diced tomatoes and a cup of the prepared TVP. I then added the spices, which included cumin, chili powder, cayenne pepper, paprika, oregano, thyme and marjoram. I then added some tomatoes sauce and finished it off with a can of red kidney beans or a small bag of green peas. That’s right, I liked this dish so much I made it two times! Once with beans and a second time with green peas. This is the “pea” variation. Honestly, this thing was really good that I made a big batch on the day my week of veganism was ending and I still have some leftovers from it. Even though I’m back to eating meat again, I totally don’t mind adding this vegan chili to my scrambled eggs to make a vegan chili omelette or making a burrito with cheese with it. Have to tried experimenting with being a vegan? What did you eat during that period? Let me know in the comments section below!